LKR Birthday in the Park! Well we had the annual EC BDayBBQ for LKR on Aug 9, and it was a rousing success! A fine day, not to hot and, even better, not too cold (for those who know these Bay Area summers….!) and many turned out to pay their respects to Rinpoche after his now-fading malady. 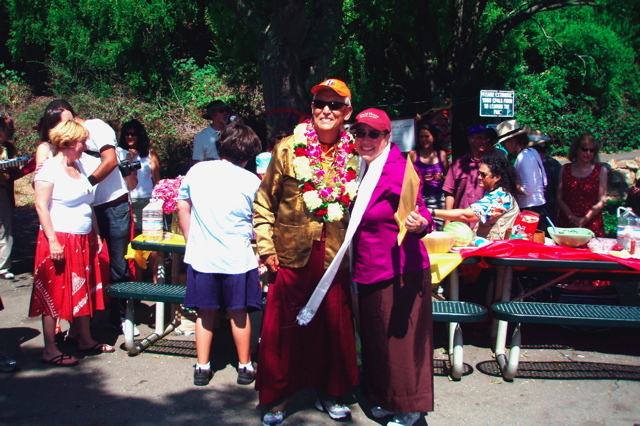 Rinpoche-la was in great spirits and health. It was also an opportunity for both Rinpoche and Ewam Choden to publically thank Ani Gendun for her absolutely essential service to Rinpoche during those recent hard times. Below, that’s her with Rinpoche!